Gmail is better than ever thanks to the update it received in April, which brought a more modern design and a ton of new features to the email client. How does it compare to Inbox, Google’s experimental email that made its debut in 2014? Here’s a breakdown of all the major differences when it comes to Gmail vs Inbox, so you can figure which one better fits for your needs. Gmail and Inbox both group similar emails into categories, but they do it differently. Gmail will automatically place each incoming email into one of five categories: Primary, Social, Promotions, Updates, and Forums. The most important emails go into the Primary category, emails related to Facebook, Twitter, and other networking sites go into the Social category, and so on. It’s a pretty straightforward process, but it has a number of drawbacks. You can’t create your own categories, which means you’re stuck with the ones Google’s set up. You also can’t schedule when Gmail should show you less important emails you don’t want to check every day, like those marked as Promotions. Promos: deals, offers, and other marketing messages. Social: emails from social networks and other social media services. Updates: notifications from online accounts, such as alerts and confirmations. Finance: money-related messages including bills and bank statements. Purchases: receipts, delivery updates, and other info from retailers. Trips: travel-related emails like flight confirmations and hotel bookings. Forums: emails from mailing lists and discussion groups. Low Priority: emails you’ve labeled as less important. Unlike with Gmail, Inbox lets you create your own categories and configure which emails it should contain. You could create a category called “Android Authority” and set it up to include every email sent to you from news@androidauthority.com. That way, you can see all the relevant emails at once without using the search box. You can also configure when the new emails you receive for each category show up in your inbox. You can choose between daily, once a day, or once a week. If you don’t want to check the Promos section every day because it’s a waste of time, you can tell Inbox to show it to you just once a week, so you can focus more on the emails that require your immediate attention. Google’s experimental email client is designed around the inbox zero philosophy. When you’re done with an email — either by responding to it or just reading it — you can hit the “Done” button to move it out of your inbox. Alternatively, you can select the Snooze option to deal with it later on. This results in an inbox with only the emails you haven’t dealt with. That way, you know exactly which ones you still have to reply to or read, which saves a ton of time. When you mark all emails as “Done,” the only thing you’ll see in your inbox is an image of the sun surrounded by blue skies (above), which means your job is done. In Gmail, you can’t move an email out of your inbox when you’re done with it unless you delete it. The emails you’ve received are always on display, which clutters your inbox and makes it harder to know which emails still need attention. This is even worse if you’re bad at replying to emails as you read them, like me. I switched from Gmail to Inbox back in 2015 and I love the zero inbox philosophy. I get a ton of emails from my colleagues, friends, and people trying to sell me stuff every day. Moving the ones I’ve responded to out of my inbox gives me peace of mind. This is where Gmail has the upper hand. It works with Calendar, Keep, and Tasks, allowing you to open and use all three services within its interface. That means you can check your calendar appointments, make notes, and create to-do lists without leaving Gmail. The email client also supports add-ons like DocuSign, Insightly, and Asana. The integrations and add-ons only work in the web version of Gmail — they aren’t supported by the Android app. With Inbox, you get none of that. It at least integrates with Google Trips, which is handy for those who travel often. It groups all your travel related emails (flight, hotel, car rental) into one folder, providing quick access when you need it. That means you don’t have to sort through hundreds of emails to find the ones you’re looking for. There are a few design differences between the Gmail and Inbox Android apps. Gmail sports a red bar on top with a list of all the emails you’ve received below it. Each one shows the name of the sender, the subject along with a short excerpt, and the date on the right side. The app also features a menu that pops out from the side and shows additional options including the email sent, drafts, and so on. 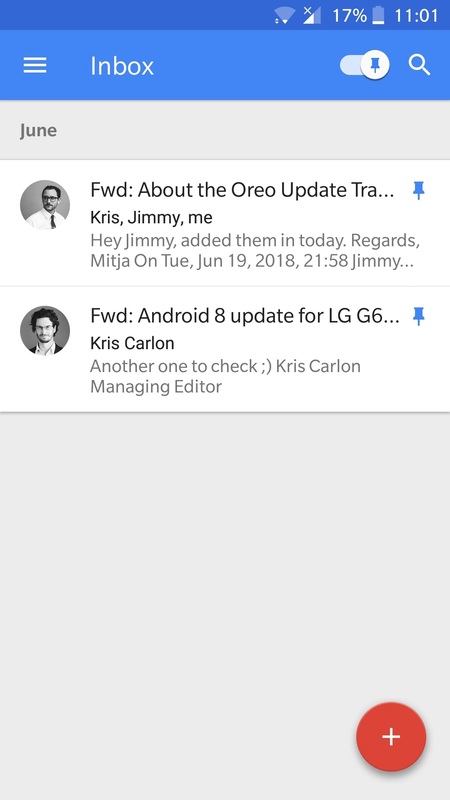 Inbox has a blue bar on top and also lists the emails below it, but it does so a bit differently. The emails are categorized by timeframe (today, yesterday, June, and so on), making it easier to find the one you’re looking for. Also, the Inbox app shows the attachments under each email, so you can open them without opening the email first. This feature is present in the web version of Gmail, but not in the Gmail Android app. The design differences are bigger when comparing the web versions of the two email clients. Inbox has a cleaner look, with a card-based design for emails and gorgeous icons next to the various options on the left side. Gmail’s design isn’t bad, but it is less modern than Inbox’s. However, you can customize it with themes, which its rival doesn’t support. Inbox has a number of features Gmail lacks, with one of the best being Reminders. 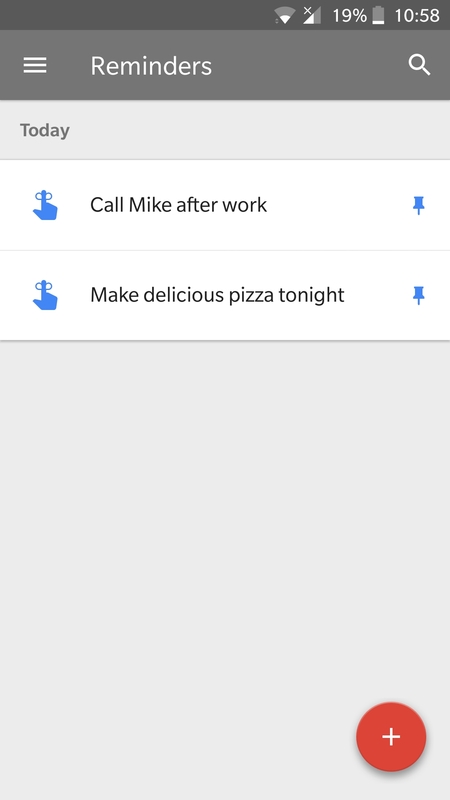 It lets you create reminders that show up at the top of your inbox and in Google Calendar. You can also add a reminder to any email you receive. There’s also a “Saved” feature available in Inbox, which lets you save links to websites you want to check out later on, though you need the Inbox by Google Chrome extension to make it work. Click the extension when on a website you want to save, select the “Save to Inbox” option, and the link will show up under the “Saved” tab in the left side of Inbox. Inbox has a number of other features too. Pinning emails groups emails all in one place via a toggle switch in the top bar. The email client will also show you contacts you email frequently when selecting the “Compose” button down below, which will save you time you’d otherwise spend entering an email address manually. The feature might not sound like a big deal, but it’s super useful. Gmail also has a couple of unique feature. You can customize swipe actions by choosing what happens when you swipe an email to the left or right on mobile devices. You can select actions like archive, delete, move to, and snooze, among others. Even better, you can download all an email’s attachments at once as a ZIP file, instead of one by one like in Inbox. Gmail’s search feature is also better — at leas the web version’s is. You can search for emails by size, subject line, and date. Gmail will also show you the ones sent by a specific person or those containing a certain word or phrase. The last cool feature worth mentioning is called Confidential mode, which lets you set an expiry date on your emails — so they’ll disappear from the recipient’s inbox at a certain time. However, only the web version of Gmail supports this for now. Gmail vs. Inbox: Which one is better? There’s no clear winner in the Gmail vs. Inbox battle. Both have their pros and cons, and it’s up to you to decide which is the better option for you. 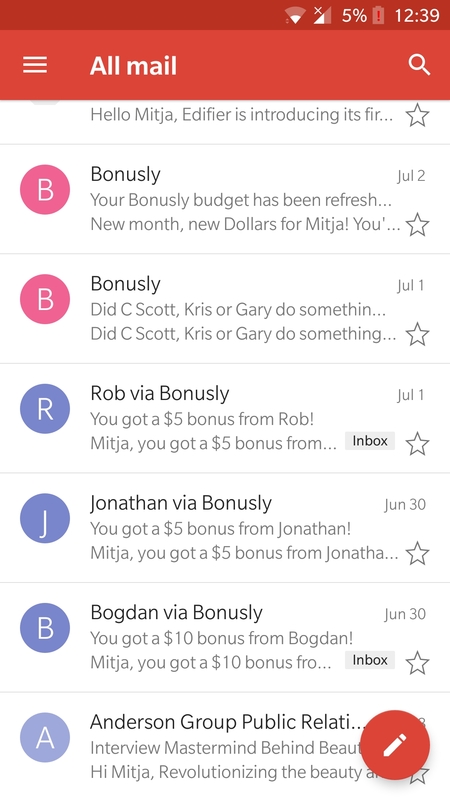 Inbox arguably has a better email bundling and management systems. I think it looks nicer, too. Gmail, on the other hand, offers more integrations and is a better fit for those who often use Google Calendar, Keep, and Tasks. It also has Confidential mode, which is a fantastic security feature I hope will come to Inbox in the near future. If you’re still struggling to decide which email client to use, try them both out to get some hands-on experience. They are free, so there’s nothing to lose. So that’s it for our Gmail vs Inbox comparison. Which email client do you think comes out on top in the Gmail vs Inbox battle? Share your thoughts with me in the comments below — I always love hearing from you guys.